(Newser) – Pope Francis officially joined the Instagram generation on Saturday, and he's already bringing a unique voice to the social media platform—in that his first post wasn't a cat video, photo of food, or selfie. 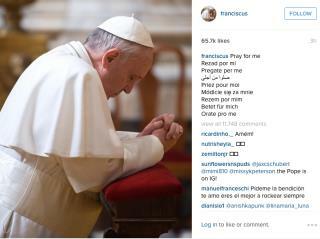 Instead, His Holiness—or @franciscus, as he's now known on Instagram—posted a picture of himself praying along with the phrase "pray for me" in nine languages. CNN reports the Pope had 100,000 Instagram followers within an hour of launching his account. His first post had more than 65,000 likes and nearly 12,000 comments in the first three hours. Instagram CEO Kevin Systrom, who met with the Pope last month, called the Pope's first Instagram post "an incredible moment" and said his "messages of humility, compassion and mercy will leave a lasting mark," according to Time. How soon before he comes a Tumblrina too? Civilization will not attain to its perfection until the last stone from the last church falls on the last priest!!!! I look forward to his galleries of things he loves, such as "All Things Tuscan" or "Kicky Kids Clothes".